Cryptosporidium (Crypto), a protozoan parasite of both domestic and wild animals, is commonly found in drinking water sources. Crypto has been identified by the Partnership as a priority pollutant of concern for the water utilities in the Potomac River watershed. Crypto oocysts (the infectious dormant form of the organism) are resistant to disinfection by chlorination and cause significant gastrointestinal illness and in some cases death. 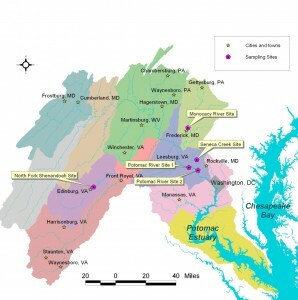 The Partnership, in cooperation with the U.S. EPA Office of Research and Development (ORD) and the U.S. Centers for Disease Control and Prevention (CDC), began the Crypto Source Tracking Project within the Potomac watershed in October 2006 to identify the specific sources of Crypto oocysts found in local drinking source waters. The results of this project are published in Cryptosporidium Source Tracking in the Potomac Watershed, by W. Yang et al., Applied and Environmental Microbiology, Vol. 74, No. 21, November 2008, is available. Crypto oocysts, which are excreted by infected animals and humans, are commonly found in lakes, rivers and streams that serve as drinking water sources. Potential sources of Crypto include agricultural activities/animal operations, combined sewer overflows or wastewater treatment plant discharges, wild animals, and stormwater runoff. Most Crypto species and genotypes are host-specific, and most are not harmful to humans. Only two Crypto species commonly infect humans, Cryptosporidium parvum and Cryptosporidium hominis, the former infecting both humans and ruminants, and the latter almost exclusively a human pathogen. The objective of the DWSPP Crypto Source Tracking project was to identify the most prevalent species of Crypto in the Potomac basin so that source water protection efforts can be focused and effective. DWSPP members collected water samples over a 15-month period at five locations in the basin (see figure above). Raw water samples were collected from two water treatment plant intake sites: Washington Suburban Sanitary Commission’s (WSSC) Potomac Water Filtration Plant and Fairfax Water’s (FW) Corbalis Water Treatment Plant. Samples were also collected at three sub-watershed locations: Great Seneca Creek in Maryland, the Monocacy River in Maryland and the North Fork Shenandoah River northeast of Edinburg, Virginia. These last three locations are upstream of either WSSC or FW’s water treatment plant (WTP) intakes and respectively represent three types of land uses potentially contributing Crypto to the raw water at the plant intakes: urban/wastewater, agricultural (cattle)/wastewater, and agricultural (cattle). A total of 64 base flow and 28 storm flow water samples were collected from October 2006 to February 2008. Samples were analyzed for Crypto both by conventional quantitative methods (EPA Method 1623) and by the CDC, using its recently developed polymerase chain reaction (PCR) genotyping method to identify the particular species and genotypes present. Since EPA Method 1623 is not species-specific and cannot distinguish between human-infectious and nonhuman-infectious oocysts, the addition of the CDC’s qualitative genotyping method allowed for identification of potential major Crypto sources as well as a better assessment of human health risks from Crypto in the Potomac source waters. The CDC’s new PCR-based method proved to be considerably more sensitive for detecting the presence of Crypto than the conventional EPA method 1623. Using PCR, Crypto was detected in 27 out of 64 (42%) of the base flow water samples and 23 out of 28 (82%) of the storm flow water samples. Only 8 out of 90 (9%) samples analyzed were positive as determined by EPA method 1623. From the PCR genotyping results, the most frequently detected species was Cryptosporidium andersoni (detected in 41 samples), a species known to infect cattle and not to be harmful to humans. Additionally, 14 other species or genotypes, almost all wildlife associated, were detected. The two common human-pathogenic species, Cryptosporidium hominis and Cryptosporidium parvum, were not detected. Although Cryptosporidium andersoni was common at all four sites influenced by agriculture, it was largely absent at the urban wastewater site. The genotyping results suggest that many of the Crypto oocysts in the water treatment plant source waters were from older calves and adult cattle and might not pose a significant risk to human health. However, since cattle operations may be the primary contributor of Crypto detected at Washington metropolitan water utilities’ Potomac River intakes, and since human-infectious Crypto species are known to be prevalent among calves, it is possible that human-infectious species (e.g., C. parvum) may be present at certain times of the year (e.g., during calving season) that may not have been captured by the limited sampling in this study. Therefore, Crypto from cattle operations is still a concern, and pursuing BMPs focused on cattle operations with calves may offer opportunities to reduce human health risks from Crypto.